An electric version of Volkswagen’s popular Up city car is due to go on sale later this year, and the company whipped the covers off the production e-Up yesterday. Unsurprisingly, it looks much like any other Up model, though there are a few subtle changes beyond the telltale “e-up!” badge on the boot. Peer closely at the VW roundels front and rear and they are tinged with blue, there are distinctive aerodynamic 15-inch alloy wheels, and new curved LED running lamps have been incorporated into the bumpers front and rear. The bigger changes are less easy to spot from the kerbside. Under the bonnet there’s a newly installed electric motor that peaks at 60kW (80bhp) – slightly more than the 75bhp maximum offered by the Up’s usual 1.0-litre petrol engine. Torque is an impressive 210Nm at low revs – more than double the best petrol grunt currently on the menu – though shove must wane noticeably as speed builds because the e-Up is no quicker to 62mph at around 14 seconds. Weight will be a factor too, of course, with the new electric battery lending its bulk to a total mass of 1,185kg or about 250kg more than a petrol Up – that’s roughly the additional weight of a full complement of passengers, by the way. Top speed is capped at about 84mph. The e-Up’s lithium-ion battery stores 18.7kWh – for comparison the bigger Nissan Leaf holds 24kWh and the upcoming Renault Zoe 22kWh – but in the dinky little Up the on-board reserves should still be good for about 90 miles, according to the official tests. Matching the quoted range on the road will no doubt require moderate weather and judicious driving, as is the case with all electric cars. To help, the dashboard provides a power-flow meter and digital range prediction to supplement the analogue battery gauge. A rapid charger will be offered as an option, which will allow an 80% top-up in half an hour from a suitable AC or DC outlet, or expect to spend about six hours charging from the mains. The batteries are mounted low, presumably under the rear seats and boot floor, to ensure that the relatively short, narrow and tall Up doesn’t topple over at the first hint of a corner. Indeed the extra low-down weight will probably improve roadholding, in the dry at least. 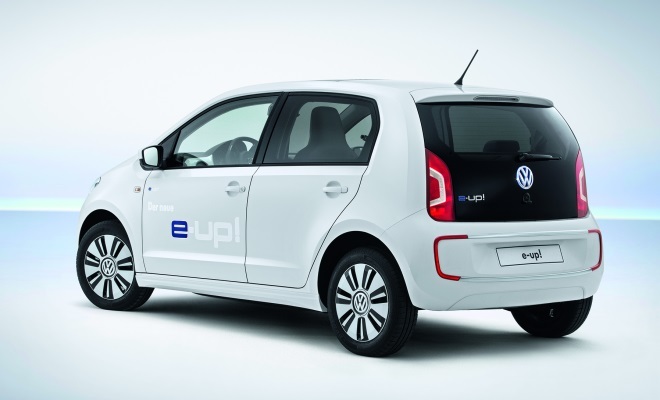 We won’t learn much more about the e-Up until the autumn, when the car will go on display at the Frankfurt motor show. Prices (and perhaps some battery leasing options) will be revealed and the order books will open at the show, with the first customer deliveries due in early 2014. Next year will also see the arrival of a bigger EV from Volkswagen, with the first fully electric Golf due to roll up. If the prototype I drove last year is any guide, the e-Golf should be worth waiting for. 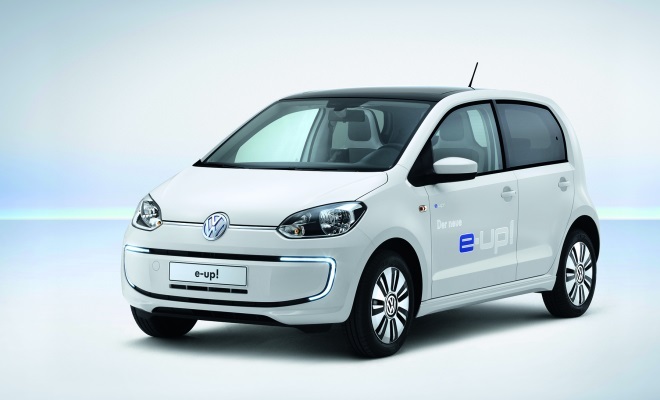 Pictures of the e-Up hint that the smaller car might duplicate one of the most welcome features of the Golf EV: the ability to choose among several different levels of energy recuperation. 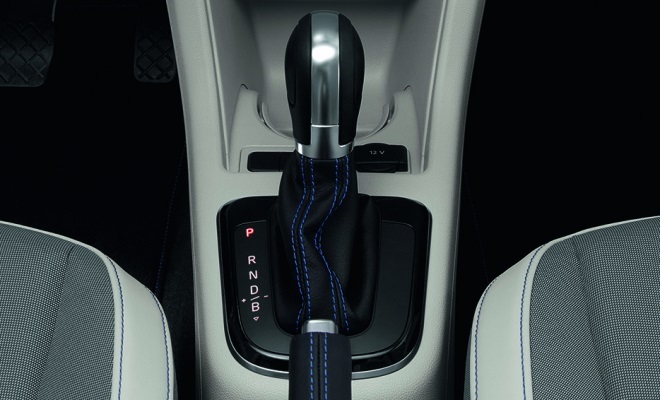 In the Golf, paddles behind the steering wheel allow the driver to flick between a coasting mode and three levels of increasing regeneration, while the transmission stick can also be pulled back into a “B” slot for additional braking effect when descending steep hills. This feature allows the driver to tailor the engine-braking effect to suit their own driving style or the patterns of traffic around them. The e-Up doesn’t have paddles but it does have plus and minus symbols painted to the left and right of the “D” slot in its transmission. Hopefully a sideways nudge or two will let the driver decide how much regen is needed from moment to moment.